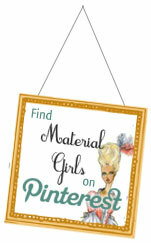 Material Girls – The best in interior design and home decorating with a sprinkle of pop culture. Hello fellow Dallasites! Haven’t forgotten about us have you? We apologize for such a long overdue post, but never fear, because we have SO much exciting news to share with you all about what’s been happening with EJ Interiors! We have been busy, busy, busy these last few months focusing on our design projects and trying not to melt in this Texas heat! 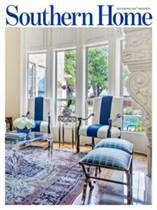 EJ Interiors has been fortunate enough to be featured in numerous press articles in recent months! We are so excited to see our hard work showcased this summer in a few different publications and ecstatic to finally be able to share it with all of you. Check out some of the great articles we’ve been featured in and let us know what you think! 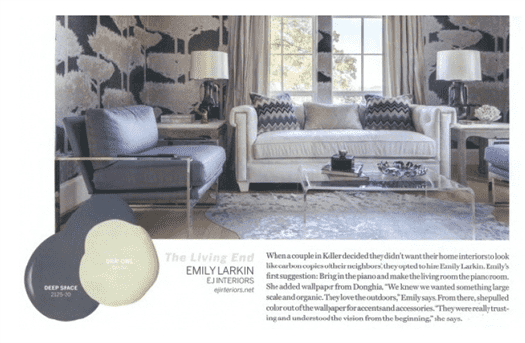 In June, it was announced that EJ Interiors was one of six winners of the third annual D Home Magazine Life in Color contest! 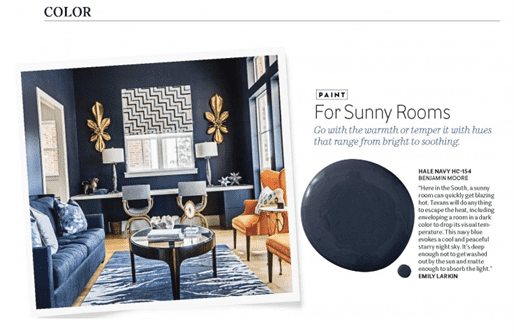 This contest is put on by D Home magazine, Texas Paint and Wallpaper and Benjamin Moore paints. Our client’s quirky “Living End” piano room was featured alongside the other five winner’s rooms. The article was in the July/August 2015 edition of D Home magazine. In July, Southern Home Magazine chose an EJ Interiors’ room to grace the cover of their Autumn 2015 issue with a ten page feature. The article, titled “Blue Reveries” showcases the Davidson home, which was updated from a dark and dated space into a modern and colorful space for a wonderful family! We absolutely loved how this one turned out. It’s on newsstands at Target and Barnes and Noble from now until October! 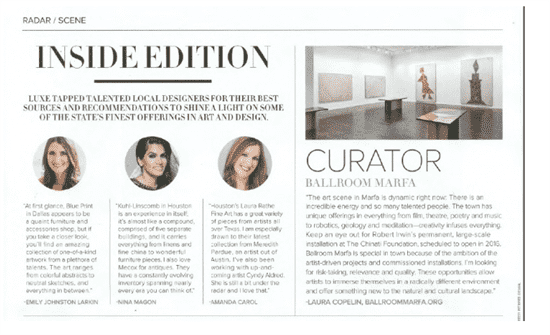 In August, we were featured in Luxe Interiors + Design Magazine alongside other designers chatting about one of our favorite art galleries in Dallas. Comments Off on We’re Back! !